Have you had a chance yet to check out our new and improved website yet? I mean, really check it out, exploring all of our pages and the wealth of information and tools we put together for you? You see, we just love what we do, and so much of that is about you and serving you! We thought long and hard about what our clients might find useful and tried to include loads of useful resources! 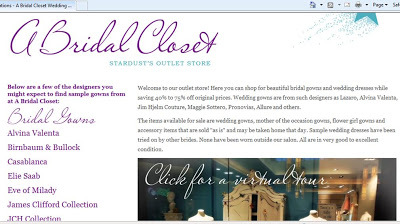 One such resource is the virtual tour of our fabulous outlet, A Bridal Closet. Yes, we have an outlet! At the lovely salon, located in The Shops of Willow Bend, you can shop for beautiful bridal gowns and wedding dresses while saving 40% to 75% off original prices. The items available for sale are wedding gowns, mother of the occasion gowns, flower girl gowns and accessory items that are sold “as is” and may be taken home that day. So take a moment to read all about A Bridal Closet and be sure to take that virtual tour…you’ll find yourself wanting to head to the chic West Plano shopping center to take an in-person tour of A Bridal Closet and maybe return home with the gown of your dreams!